One of the most beautiful things about traveling is matching an experience with a personal moment of our lives. A connection between our current state and a place that we are likely to remember forever. I recommend this trip if you are looking for perspective, adrenaline and mental stimulation. 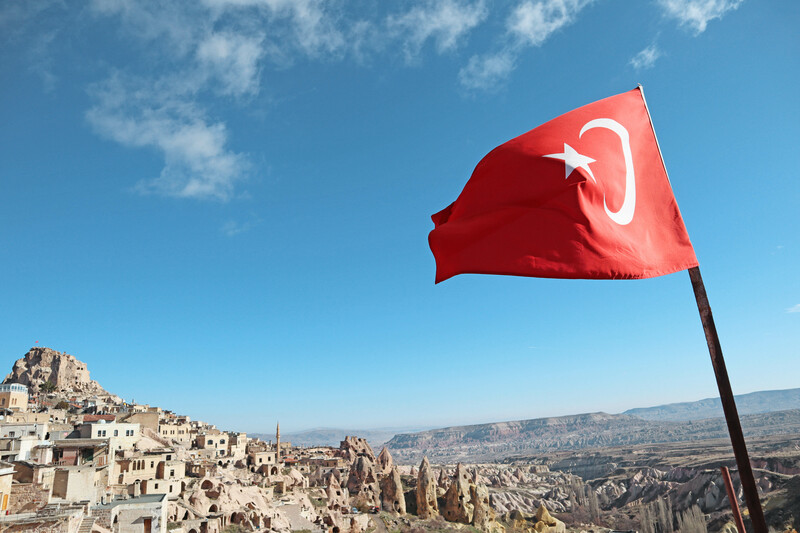 Turkey, with its varied landscape, architecture and delicious food, makes the perfect location for a big celebration. 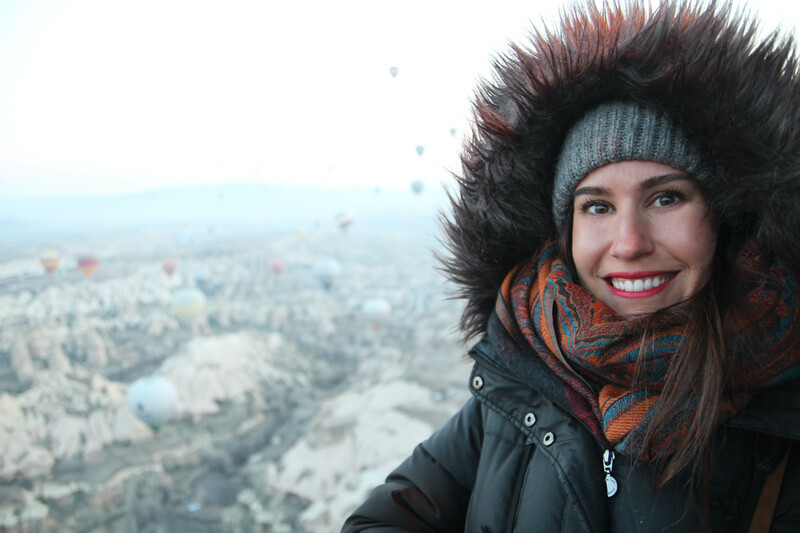 Cappadocia was the magical place were I turned 30. If you are also choosing this stunning area of Central Anatolia for creating new memories, here are some tips to make your trip unforgettable. Important Note: This article doesn’t contain any affiliate links or sponsored content. The length of the trip is dictated by the probability of flight. Balloons depend on weather conditions, especially the wind. If it’s windy, no matter how sunny it is, balloons won’t run. 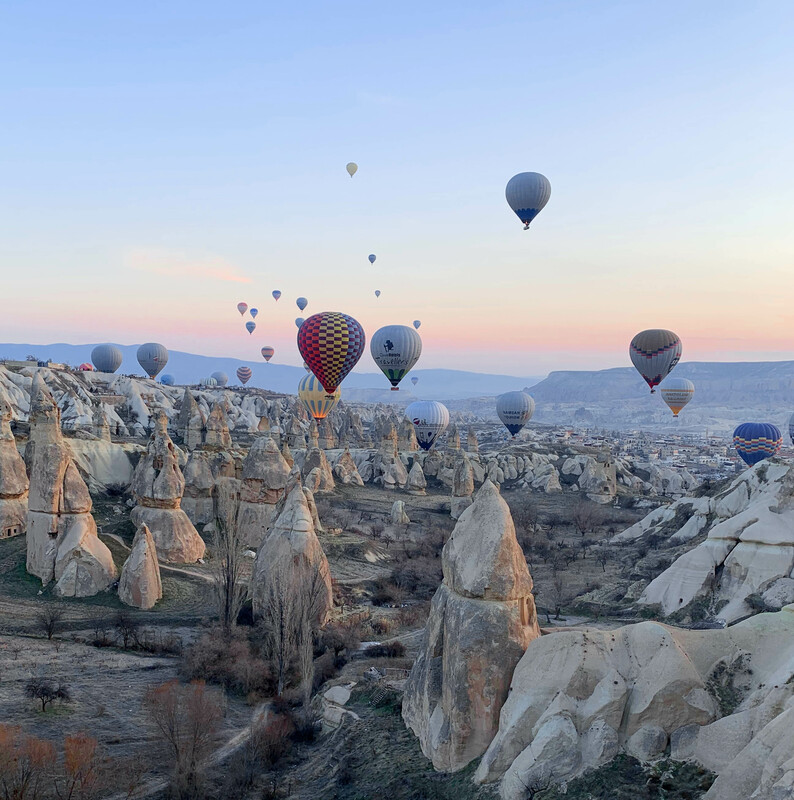 That’s why you want to leave at least 3 days in Cappadocia, just in case the weather conditions aren’t great when you arrive. Also, be sure to do the experience the first day possible. We arrived on a Sunday evening and did the experience the following day. We were very lucky as balloons didn’t run again until Friday that same week. The advised time to book your experience is 2-3 weeks in advance. The perfect combination is 3 weeks before as flights and hotels offer the best prices. Before then is a bit pointless due to the weather conditions uncertainty, especially in the fall / winter seasons. There are about 100 companies that run balloons. 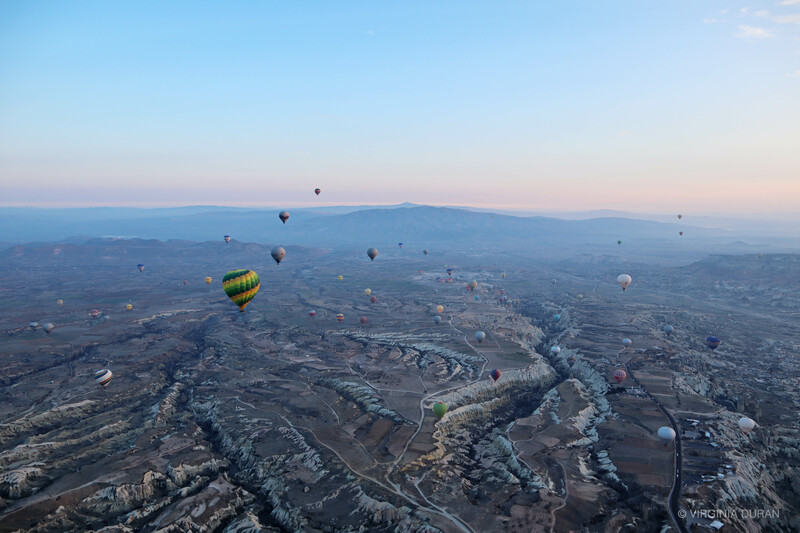 If your main concern is safety, I recommend Cappadocia exclusive. 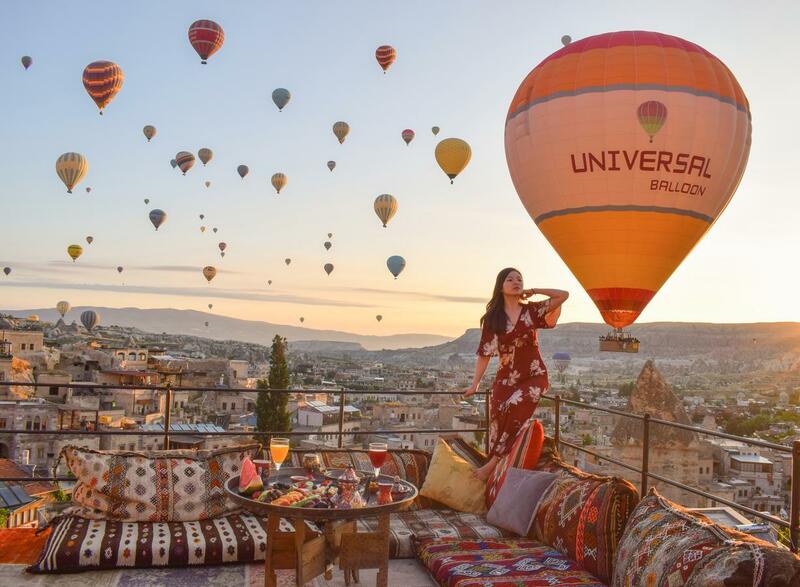 You need to send an email to info@cappadociaexclusivetravel.com requesting the experience (there’s a couple you can choose from in their website) and specifying the number of people. We booked the standard flight, which was supposed to cost 150€ upon cash payment. We were requested to pay 35% in advance and then negotiated a bit when we were there in person, ending up in a total of 140€ per person. About the experience itself: Wow! Make sure you go to sleep early the night before as you’ll be picked up – depending on the location of your hotel – around 5.30 am. You’ll have access to a light breakfast and tea and then will have to pay the rest of the total amount. Make sure you negotiate the price before this point, we did the night before through WhatsApp (+90 554 9281915). Around 6 am, just about time for sunrise, you’ll be directed towards your balloon. Things get exciting. 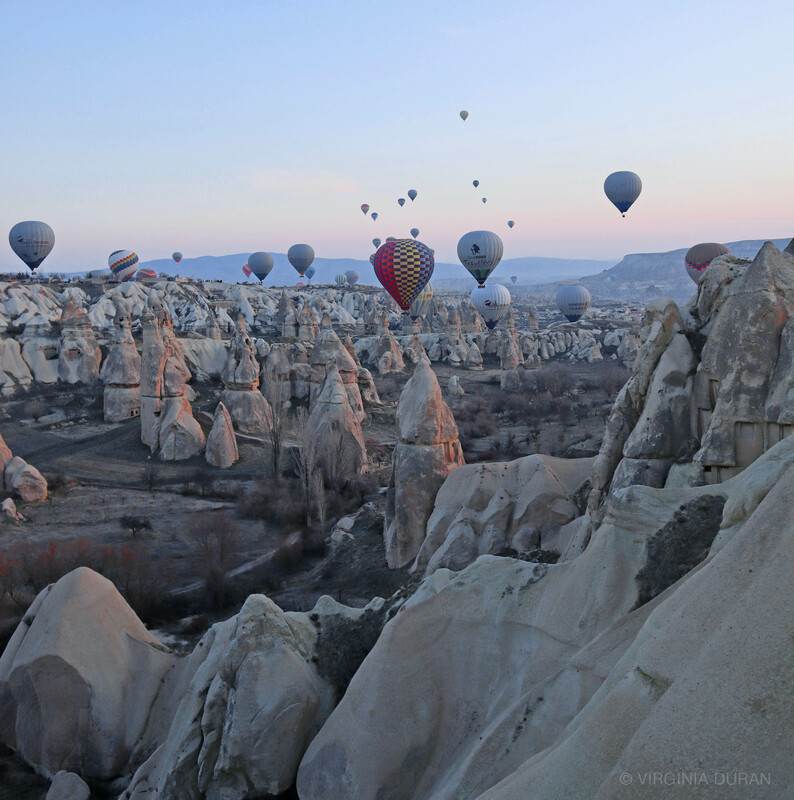 2) there are around 200 balloons around you which makes the scenery even more beautiful. 6.10 am: all the other balloons around you are being lit up with flames. You’ll still be sleepy but the image of so many people around you, smiling, while the sun is slowly starting to rise will get your heart open and elevated. 6.20 am: some balloons are starting to take off and you see that yours is too. You can feel the danger of being at the mercy of gravity. 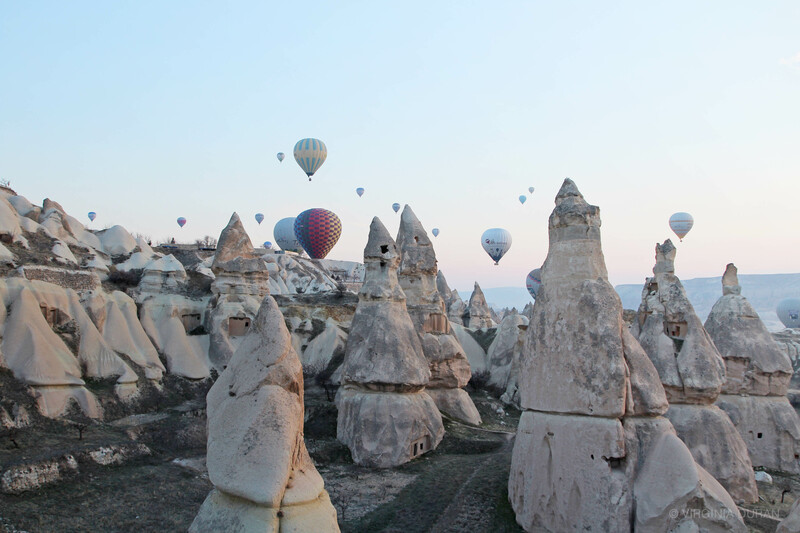 You’ll slowly take off and see how hundreds of balloons peacefully rise to the horizon. You will feel lucky and motivated, grateful to be alive. Now the most meaningful thing is about to happen. 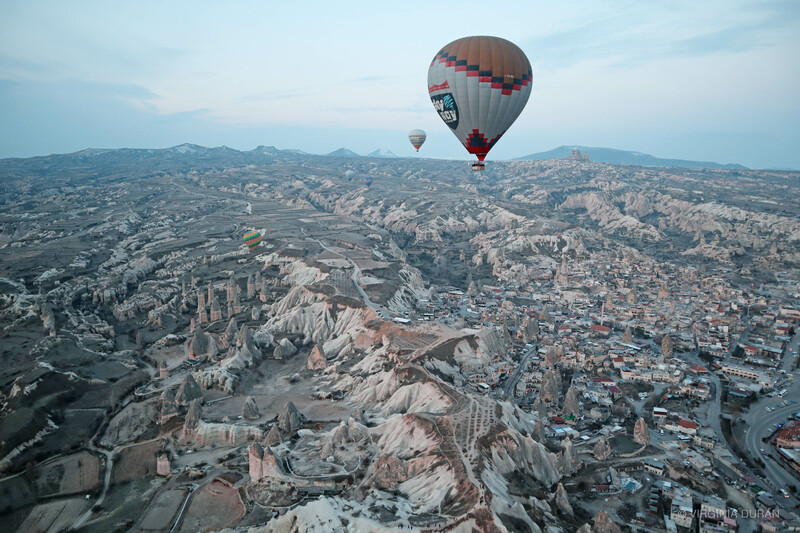 The balloon operator would descend to the valleys to show you the surreal landscape a bit closer. The rock formations, aggressively shaped by the wind, will pass so close to you that you will fear a collision. But you won’t collide. You’ll be in awe of the scenery constantly, with the magnificent light in non-stop change. The pastel colours of the sun, with all the other balloons in the background is one of the most visually stimulating things I’ve got to see in my life, it was mind-blowing. Words can’t describe the feeling of being suspended in the air, in silence, with a gentle breeze over your face and the world opening upon your eyes. My conclusion: You sometimes need to elevate yourself and see the perspective. The spiky landscape, which seems especially difficult to traverse from the ground, looks beautiful when seen as part of the site plan. It’s a philosophical and physical experience. Where to book them? Kayak. How long in advance? 3 weeks were the cheapest. How to get to both airports? Upon arrival in Nevşehir, there are shuttle buses going to the different areas. They won’t drive you up to the hotel doorstep but walking distances are short, 5-7 min. The other option is a private taxi, which accommodates up to 4 (we were a group of 6 so it didn’t really work) and which is subject to the prices you negotiate. We paid ₺120 for 6 people in the shuttle. From Istanbul, Uber works but you need to be discreet with the pick-up. It cost ₺186 (around 30€) to go from Sabiha Gökçen Airport to Sultanahmet. That was the best price we could get. Probably your driver will suggest meeting in a specific area far from the taxis. I tried all combinations to fly directly but it was always more expensive (£1000+) and anyways it included one stop in Istanbul. You may as well spend a couple of days before and after in the city. In fact, there are plenty of things to do in Istanbul. Göreme: Young atmosphere. Good value. We chose Göreme because of the restaurant offering – more abundant and better – and because it had exploring areas within walking distance (such as the Open Air Museum). Part of the charm is to stay in a cave hotel, which can be a picturesque experience or a claustrophobic one. It’s very intriguing to see how locals have adapted their architectural needs to the landscape. However, the reality of it is that you’ll probably have sand falling off the ceiling and that the piping system is so dreadful that you’ll have to brush your teeth in the bedroom because the bathroom stinks. We stayed in two hotels, Angel Cave Suite, which wasn’t great. And Mithra Cave Hotel which was nicer; but the concept is the same. Be very careful when you book hotels as you can see Angel Cave Suite had a stunning 9.4 on Booking.com and still was very dirty, had no windows in some bedrooms and perhaps the worst; some of their staff were quite rude and bullying. We were welcomed with a “You didn’t pay on Booking because your card is wrong, pay now in cash”. Needless to say is that we avoided any contact with him and didn’t book a thing with them. More in the next point. As a summary, you want to spend a bit more in the accommodation to ensure you don’t have dodgy staff pushing you to buy the Green and Red tours through them. Sand falling off the ceiling is unavoidable though. Everybody will try to persuade you to book the Walking tour, balloons, rides etc, with them. It works based on commission and this can sometimes be tricky. You don’t want to end up in a big group of whatever your hotel manager chooses. 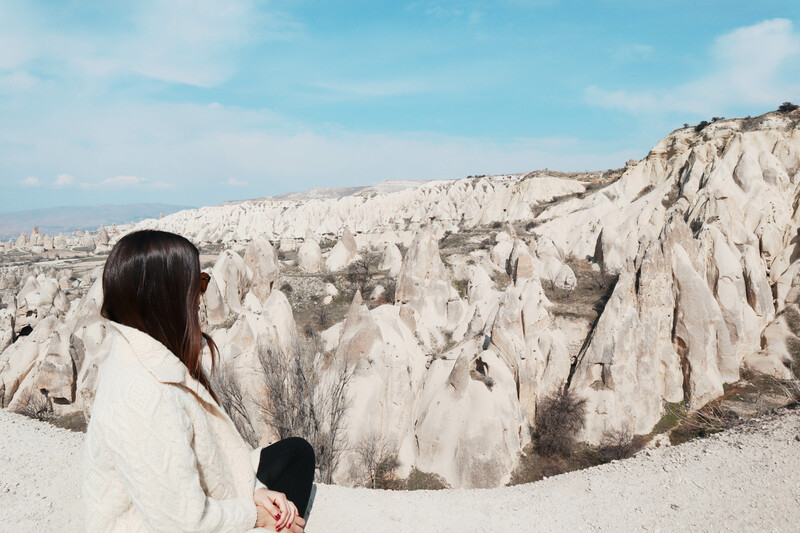 We booked a Green Tour (33€) and Turkish Night (30€) events through Esco Tour Göreme (+90 5435061138), we looked at all the agencies in person and chose based on our impressions. Because they seemed trustworthy, we also booked our transfer back from the hotel to the airport with them. He offered a private van for the transfer if we paid a bit more – which we declined – and when he came to pick us up, guess what? it was a private van anyway. Open Air Museum: Close to Göreme. Walking distance from the city and beautiful landscapes on the way. Very recommended ruins and excavated houses, monasteries and churches dating back to the 4th century. Sunset Point: It’s also nice at sunrise when you can see the balloons from the ground in the morning from this vantage point. Green Tour: This tour goes from 9.30 am to 5 pm. 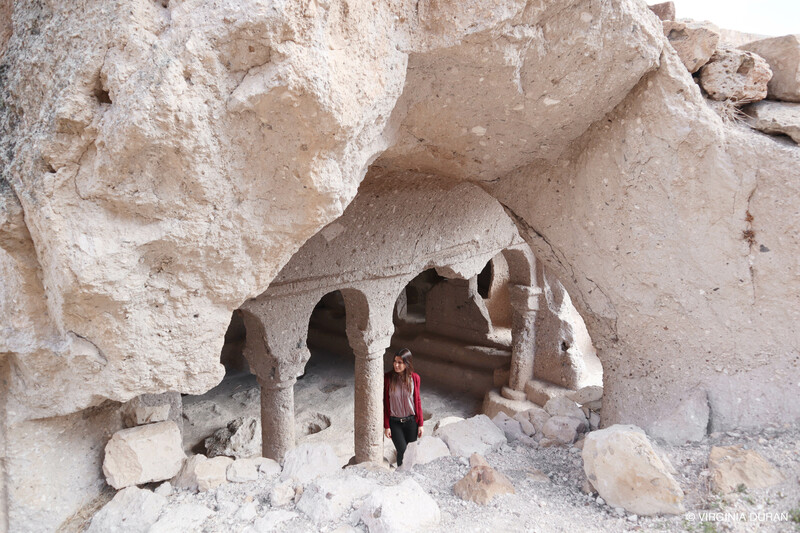 You’ll explore the impressive (but very claustrophobic) Derinkuyu Underground City, Ihlara Valley, Selime Monastery (see pic below), Pigeon Valley and Göreme Panorama. Turkish Night: It’s a very touristy thing but oh the fun. You are in (yet another!) cave with about 100 people enjoying greasy popcorn, baked beans and Russian salad (are they trying to please us all?) and there’s a lively performance which gets a bit cheeky when the night advances (less and less clothes). They were very good entertainers and picked up people from the public which was amusing. Our friend got to make some moves with the belly dancer which was hilarious (him, not her!). 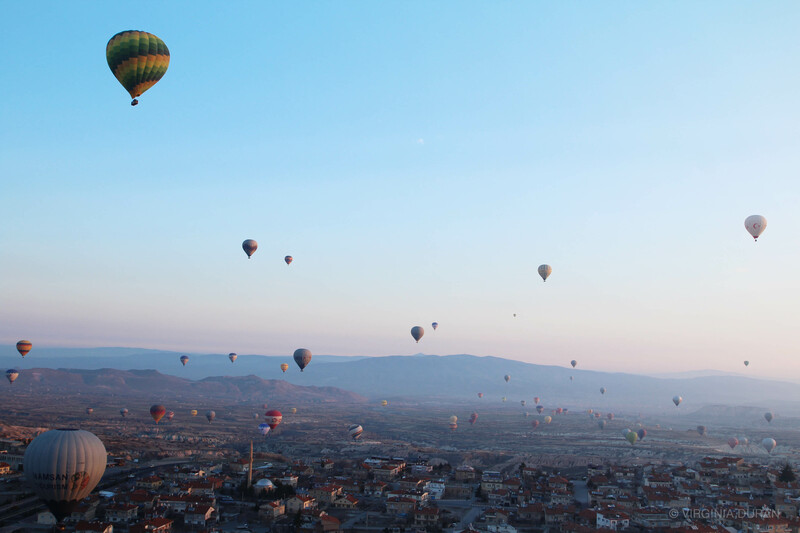 Tags: Architecture, Cappadocia, Instagram, landscape, Photography, Travel, Turkey. Bookmark the permalink. Any other ideas for your 30th? my feet on the ground Virginia. this is another story. This is doable.